You can access the Production Job page from the Discovery menu. You will use this page to prepare a discovery production set, including Bates Stamping and saving out the documents in the production set to your desktop (it will be part of a zip file). From there you can copy to a flash drive, DVD or CD or shared by private link with outside parties or staff who are not registered as users into Lexbe Account. NOTE: We have merged the Bates Stamp and Production pages into this new one for faster and more responsive productions. Now you can convert and produce PDF and TIFF documents on the fly, including loadfiles versions for both Summation and Concordance automatically. -'Production 06-25-2013'. If you want, you can also edit the production titles (e.g. Enron Case Production 06-25-2013). You can only create one Production at a time! 1a-Selecting Productions. This section will expand/collapse a title drop-down list of all previous productions that you can select to edit, download or delete. If you want to view production details, just click on the on the hyperlink 'All Productions'. >After naming your new job, switch to the Browse or Search pages and filter the files you want to produce. >Use the Multi Doc Edit section to select one or more documents by the Title field (check-box), and then code them as ‘Responsive’. (This option allows you to review and tag more than one document at a time). If you want to view which documents were already marked as ‘Responsive’ or ‘Bates-Stamped’, click on the section ‘Show Columns’ to display both columns. Lexbe eDiscovery Suite Platform also allows you to review/tag using Linear Review. You should expect an approximately 10 GBs/day rate (~200,000 pages) within your Lexbe eDiscovery Platform account (combined all cases) to create Productions (including Bates numbering) for Standard PDF productions and 2.5 GBs/day rate (~50,000 pages) if TIFF Productions are selected. Your download time is in addition to this, and will depend on your internet download speed. PDF productions will be approximately the size produced, while TIFF productions expand significantly (generally 3-10X, but sometimes substantially more depending on the specific files). For larger productions, please contact Lexbe Sales for a services quote, as as a managed service we can handle very large productions within days. Production and briefcase creation increases your monthly hosting cost as it uses more storage. We bill on the basis of the highest usage in the account within the month, so creation of a production or briefcase will also be affected. For PDF productions and briefcases, the size of the production will be approximately the size of the original documents produced. For TIFF productions, the size will be several times larger usually, as TIFFs are rastorized images of documents and much larger in size than the original natives or PDFs. >After you tag the set of documents as 'Responsive', still on the Browse or Search pages expand the section 'Productions' to choose a production by title with the 'Add Docs to Production' option. Now you can close the Browse or Search pages, and go back to the Production Job page to complete the Production. 5-Select and remove documents from the 'Productions section>Remove Docs from Production'. This action will remove the selected files. Please note that you not will have this option, if you have already ran the Production from the Discovery page. 6-Once you finish removing the files manually, return to the Production Validation Page and make sure each tab has passed the validation. Title. Unique Production Name (dynamic hyperlink). If you click on the production hyperlink, it redirects you to the Browse page automatically filtering on set of documents you added to the production. Comments. Here you can include any other notes or comments that will be helpful in organizing or administering the production. Created By. 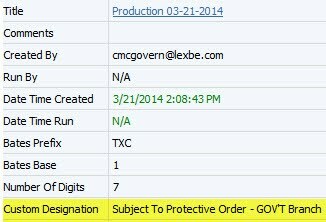 It shows which user in Lexbe eDiscovery Suite Platform initiated the production. Run By. It will indicate which user clicked on the 'Run Production' button and produced the files. By default is 'N/A' if no user clicked on the 'Run Production' button. Date Title Created. Indicates the date and time the production started. Custom Designation. If you previously entered a custom designation text from the Case>Case Details page, by default the same message will show up under here every time you start a new production. This is an editable field, which means you can remove, edit or enter unique custom designations for each production you create from the Production page. The custom designation will only be displayed on a set of documents (at a page level), after you tag a set of documents using the built-in field 'Custom Designation'. For more instructions, please see paragraph 'How To Use Custom Designation'. Bates Stamp Pages. After you have selected the Bates Prefix and Bates Number, you can check mark the 'Bates Stamp Pages'. Once check-marked Lexbe will apply a Bates file name to all documents in the production set, and assign Bates stamps to the responsive documents in this module. Bates stamping is not yet applied to the individual pages of PDF files, as this is done as part of creating a production set. Production Type. You can choose to create a Standard PDF production or Standard plus TIFF. Now you can convert and produce PDF and TIFF documents on the fly, including loadfiles versions for both Summation and Concordance automatically. Standard plus TIFFs are rastorized (bit-mappped) images and much larger than natives or PDFs (the download size will be 2-5X bigger than PDFs). Your Lexbe eDiscovery Suite Platform case will still have the PDF versions and the Bates numbers of the production so you can view, download and Bates stamp PDFs which should identical to the TIFF versions in substantially all or all cases. Documents Produced. Total of files produced. Privilege or Work Product. You can see which files are coded under the 'Privilege' and/or 'Work Product'. Privilege' and 'Work Product' files are not included to the set of documents from the Production Job page to assure that those files are not inadvertently produced. When you apply bates during a production Lexbe eDiscovery Suite Platform will withhold the Privilege or Work Product files, and the set of documents will have the ending bates range that you can review in the 'Withheld Range' section. You can also download and save the withheld files to your desktop by generating an Excel report for further analysis from the Privilege Log. Docs Size Produced. The final size of your production in GB. Docs Size Withheld. Total size of the documents withheld as Privileged or Work Product. Produced Range. This displays the Bates Range of the of 'Responsive', but not ‘Privileged’ or ‘Work Product’ documents in the Production Set. Docs Size Total. Total size of files produced in GB. Produced Range. It will display the number of 'Responsive' documents selected for the production. When you click on the 'Run Production' button, it will give you the option to receive an e-mail notification once the production job has completed. The email will be sent to the user who created the production. Validate Production. Before you run or download a production, review the files by clicking on the 'Validate Production' hyperlink. This action will take you the Production Validation page, so you can detect if files have been consistently coded within a production batch with the Lexbe eDiscovery Suite Platform 'Responsive', 'Privilege' and 'Work Product' tags. Download Production. Open the Production page in Lexbe (Discovery>Production Job), select the Production Job you wish to download from the left menu, and click on the 'Download Production'. Depending on your browser and settings, in some cases the download will automatically start and in others you will be prompted for a download location on your local computer. Once the production is created the button 'Download Production' will not be grayed out anymore, indicating that you can download the production to your desktop, flash drive, DVD or CD. When Lexbe eDiscovery Platform is generating productions, LEP divides the production into parts for download convenience based on an internal file count. Smaller download parts are quicker to create and to download. Also web browsers vary as to what size of file size they can download at a time and smaller sizes allow LEP to be cross-platform, cross-browser for user flexibility. The download parts should all be downloaded and combined for QC, and not analyzed separately and they are formed based on speed, not separate QC. The individual download parts include files based on the internal document ID within Lexbe eDiscovery Platform, not on Bates. Creating production download parts based on the Lexbe DocID allows productions to be created faster within Lexbe eDiscovery Platform to be available for download faster. Delete Job. We recommended that you delete any unneeded Productions immediately after you download them to your local desktop, and before the next billing cycle (last day of each month) to avoid increasing usage charges. We should only click once for a function (e.g. 'Run' or 'Download'). Multiple clicks can slow, interrupt processing or send conflicting instructions to the server. If you want to start new productions or download files to Briefcases, please wait until the uploads have been completely processed in the server as this may affect the page count for each document you are trying to apply Bates stamping and/or produce. Whenever you create a new production you can keep track of existing bates sequence, prefix and range as well, from this section. If you need to re-run a production for some reason (e.g. 'needed to add more files to production', etc. ), you can simply start a new production from scratch. Each production run will set the Bates Number and if a document was part of a previous production, its Bates number will be updated to reflect the latest production. If you code your documents only using the ‘Confidential’ and 'Responsive' tags during your productions or downloads, the files will only display the Bates and the word ‘Confidential’ at a page level. Lexbe eDiscovery Suite Platform productions include non-privileged and non-redacted native files in the system, including native attachments to emails and natives expanded from Zip and other supported container files, in the 'Originals’ folder. However, the Originals' folder as part of productions will not include email MSGs, Zips or other container files. This is done to assure that native versions of privileged, work product or redacted documents that as nested inside of container files are not inadvertently produced. 1- Create a production directly from the Browse or Search pages and apply Bates stamp to the PDF version of the files. The document production will generate a briefcase containing the folders ‘Originals’ and ‘PDF’. In case the PDF version of the file is not legible, the same file (native format) under the Original folder can be opened in Microsoft Office or other native applications on a local computer and reviewed. 2-Redact the file attachments not to be delivered and download the entire email family as PDFs to your local desktop. 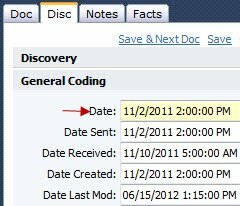 Go back to Lexbe eDiscovery Suite Platform and delete the original emails and re-upload the redacted PDFs (now family broken), and then update coding. We also recommend that before you delete the originals emails, to also export a log to an Excel spreadsheet to maintain original emails before deletion and be used to update. 3- You can download the native files not converted and manually convert them to PDF using third party conversion software. Delete the native files from the case and upload the PDF versions before you start a production. 4-We can go back to the database, prepare a comprehensive analysis report and convert the files if it is possible. As previously discussed, this request falls outside the scope of our standard free support services and basic troubleshooting (see link below). If you want us to prepare a manual or semi-automatic file conversion and research discovery specification as part of our technical support services, please contact our Sales Department. The Bates Range of documents in a Production Job to be produced, and Privileged documents withheld, is not determined until the job is completed. It's a common practice to have different Bates prefixes for associated productions to allow independence of Bates ranges. 1- Run one production at a time. In this case, you will get the Bates Range (for produced and withheld documents) on completion and that range can be used to generate the start of the next production. You can use a recent version of Acrobat Pro or another PDF Bates-stamping utility with granular page-offset options, re-size the images and re-upload to Lexbe eDiscovery Suite Platform in order to make the Bates stamps clear visible at a page-level. Alternatively, we can do this for you as a paid technical support service. Very small PDFs, JPGs and other supported images uploaded to a case may be too small for a Bates number to print on converted PDFs or TIFFs. In this case, the Bates number number will be applied to the Bates name, and in our Lexbe eDiscovery Suite Platform case database (if applicable), but will not be readable on the document as the image is so small. These small images usually have no evidential value and you can delete (if producing from Lexbe eDiscovery Suite Platform) before a production if you wish. 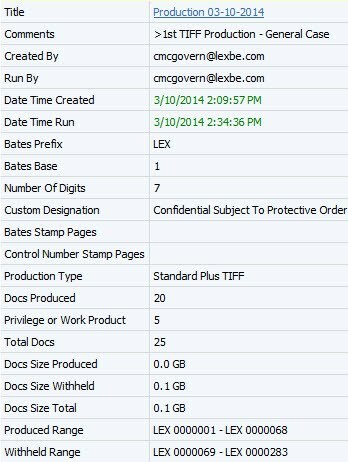 Bates stamping of PDF files in Lexbe eDiscovery Suite Platform can generally be done at approximately the rate of one GB/hr (usually about 15,000 pages/hr) to produce a Zip file with Bates stamped documents at the page level. This rate can vary quite a bit based on individual document characteristics. Additionally, partially corrupted PDF files can delay or stall Bates stamping and productions. Running multiple productions at a time will not speed the process (and can sometimes slow it), so only one production at a time should be run. After the production completes, a Zip file link will appear on the Case>Download Case Documents page. Then downloading will take additional time depending on your local internet download speed. Given these variables, we recommend building in an additional day or two of cushion before production deadlines on large productions. After checking your production you can also make a shared download link available to opposing counsel to save courier time. You also can download a production log of the documents produced by filtering on the documents produced in the 'Browse' tab, selecting the fields to export (e.g., Bates number, Sender, Receiver, Doc Type, Doc Date, etc. ), and exporting to Excel. If a special Summation or Concordance load file is needed instead, contact your sales representative. You also can download a privilege log, (documents marked attorney-client privilege or attorney work product), by filtering on the productions and selecting the fields to export (e.g., Bates number, Sender, Receiver, Doc Type, Doc Date, Subject, etc. ), filtering on documents tagged as 'privileged or 'attorney work product, and exporting to Excel.